New Testament - Today's readings in Acts 18 are important in that Paul is beginning his work of building the church in Corinth through his ministry! We of course are very familiar now with Paul's letters of 1st and 2nd Corinthians - today we get a glimpse of how Paul's relationship with the city of Corinth began. Verses 9 through 11 let us clearly know that the Lord was very involved in Paul's ministry in Corinth - "One night the Lord spoke to Paul in a vision and told him, "Don't be afraid! Speak out! Don't be silent! For I am with you, and no one will harm you because many people here in this city belong to me." So Paul stayed there for the next year and a half, teaching the word of God." Discovering the location of Pontus revealed to me more of God’s working in history. Paul had such a passion for the Gospel, and to honor the Gospel and Presence of the Lord Jesus. Paul had such a passion that—even though (for whatever reason) Jesus Himself would not allow Paul to go to Bithynia—God brought Bithynia to him! Do I have a passion for Jesus and His Gospel? Do you? Do we? These are not meant to be condemning questions, but honest questions that I need to take time to meditate upon. This reminds me of another verse in Acts 18. And how did the people in Bithynia hear about Jesus, the Christ (the Anointed One)? It is interesting that somehow—even though Paul was not allowed to go to Bithynia to preach the Gospel—the Name of the Lord Jesus was being raised up in Bithynia, albeit by the complaints of Jews against “Jesus Christus” as Roman historian Suetonius writes. When we surrender ourselves fully, entirely, and wholly over to the Lord—this allows Jesus to manifest to us the full, entire, and whole surrender on the Cross that He has already provided for our salvation and protection to do God’s will. One thing that's pretty cool is that Sosthenes (the synagogue ruler that got beat up by the Jews) must have become a Christian because he is named/listed with Paul as one of the writers to the Corinthian church in 1 Cor 1:1. 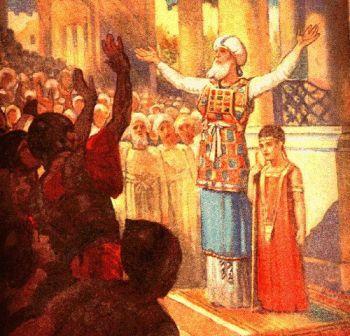 God used Paul to convert not just 1 but 2 synagogue rulers! I love that song from the Young Life songbook. It's one of the ones we sang the weekend I gave my life to Christ. Love it, love it, love it. Thanks for posting the lyrics. Corinth was a major city of the Roman Empire, at an important crossroads of trade and travel; it was also a city notorious for its hedonism and immorality. i. 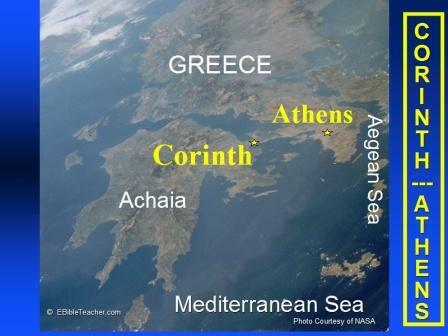 Even in Paul’s day, Corinth was an ancient city. It was a commercial center with two harbors and a long rival to its northern neighbor, Athens. Corinth was a city with a remarkable reputation for loose living and especially sexual immorality. In classical Greek, to act like a Corinthian was to practice fornication, and a Corinthian companion was a prostitute. This sexual immorality was permitted under the extremely prevalent worship of Aphrodite (also known as Venus, the goddess of fertility and sexuality). In 146 BC, Corinth rebelled against Rome and was brutally destroyed by Roman armies. It lay in ruins for a century, until Julius Caesar rebuilt the city, and it quickly re-established its former position as a center for both trade and immorality of every sort. Corinth in Paul's day was a large and prosperous commercial city, one of the leading cities in Greece. It owed prosperity not only to the trade that flowed through it, but to several other factors as well. Corinth hosted the biennial Isthmian Games, which drew large crowds to the city. It a had the coveted status of a Roman colony and was the capital of the main province of Achaia (which is why the city's unbelieving Jews were able to bring Paul before the Roman governor, Gallio; Acts 18:12-17). Corinthian brass and pottery wares were famous throughout the Roman world. But Corinth also had its dark side. A sizeable percentage of its population consisted of slaves, and it was a center of the slave trade. Corinth was such an immoral city that its name became a byword for sexual vice; the verb "to Corinthianize" meant to commit sexual immorality, and 'Corinthian girl" became a slang term for a prostitute. 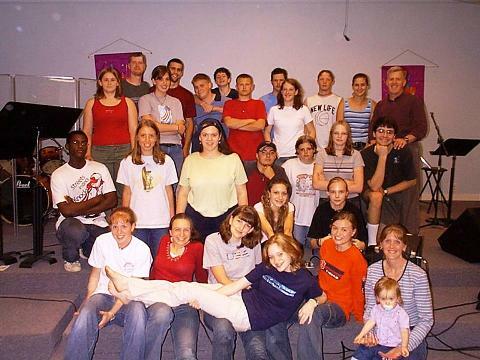 amazing that a church existed at all in such a city. Apparently Paul was afraid - maybe as Bob said because success in preaching to Gentiles may intensify opposition. Maybe because Corinth was "such a tough town". Regardless the Lord gave Paul assurance that he would not be physically harmed. At this time it must be that Paul needed this to be a fearless and tireless preacher of the "Word". As before time when God knows the very number of the hairs on our head, God knows His people - and provides for them. In Corinth at this time - Paul is that provision. 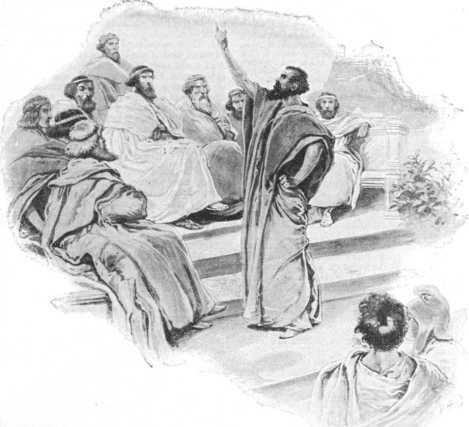 In approaching the proconsul of Achaia, the Jews of Corinth are trying to stop Paul not only in Corinth, but also in the entire province (Achaia). religio licita: Latin for "legal religion"
Julius Caser accorded this status (religio licita) to Judaism, and it is more than likely that Gallio - as other Romans (in government) thought - considered Christianity a branch of Judaism. Around 60 A.D. this staus for Christianity changed as Rome realized it was a distinct religion from Judaism. Chrisitianity became an "illegal religion" and the persecutions started and grew in intensity. 1) as a dispersed nation it was important For Judaism to have this protection - without it, it is doubtful the people or religion would have survived. 2) God took the church's biggest persecutor (Paul) and made him one of the early church's greatest evangelists. 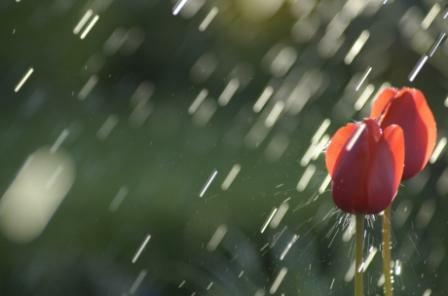 Avoiding elimination and ensuring growth. 3) Christianity's early status as a "legal religion" protected it from persecution (elimination) until a time where it had grown past "critical mass" (such a size that it would be impossible to eliminate). The "legal religion" status was a Roman thing. It did not keep the Jews from trying to stop growth or from persecuting Christians. And if Rome got involved it would be because of alleged "civil unrest", rebellion or something of that ilk. While incidents of that did occur with Roman officials getting invovled - they were sporadic. It was not until the persecutions of (around) 60 A.D. and on - that persecution became widespread. Okay John and Roslyn I stand corrected. I am sorry that I shared the Einstein story in yesterdays comment section, with our group. I guess I need to stick to the bible and the study. The gentleman that E-mailed this story to me is someone I met online. He is a well meaning Christian man who is on disability. He was injured and almost died on the job. I think he has way too much time on his hands and is somewhat lonely. He attends church and does ministry work. I actually met him in Christian chat room #3. Not that I condon visiting chat rooms. Another avenue of fellowship. I would just to add, that I invited this friend to join our group because I know that I enjoy reading the word and value everyones comments. This is our chance to get to know each other and to fellowhip, even though this is the internet. I have learned so much from all of you. I respect your rebukes as well and understand your point. Roslyn made a very good point when she said that our experience of God does defy all logic and principles of physics. Her comments really made me think. Jehu: One can carry out the will of God, operate in obedience to God’s directions and command and still turn their backs on God. Activity and movement without momentum does not that someone is righteous. WE must wait around for the fruit to appear and then inspect it. Athaliah: Many a time I get this strong unction that, the devil does his best recruiting on the “church bench.” Yet here we see that the best place to hide the future king was in the Temple. 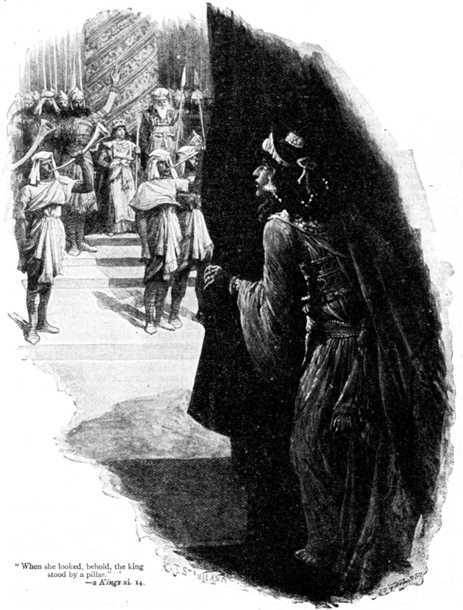 Athaliah never thought to look there because no one every whet there to worship anymore or she just had this “thing” about going inside the House of the Lord. I also see from her that we have the propensity to demand of others what we are unwilling to do ourselves. Athaliah cried, “Treason,” when she saw Josiah being crowned king, yet she had treasonously killed off ever heir to the thrown, except Josiah seven years before. We cannot demand from others what we are unwilling to do ourselves. We become hypocrites. The clergy of yesteryear had as much trouble keeping their hands out of the cookie jar as they do today. It was the “working class/blue collar” man that dealt honestly with the monies given to them to repair the Temple. The priests in charge of the collection could not be trusted to “take some of the money to repair the temple,” (II Kings 12:5). No matter what we think the preacher is or is not doing with the collection box, we are suppose to do what God tells us to do, give and do the work of the ministry. Twenty-eight years: This was a long reign, but notable only at its beginning. Jehu had the energy and influence to truly turn the nation back to God, but his half-commitment to God left that potential unfulfilled and points to a lack of any real relationship with God. But Jehosheba: This little-known woman had an important place in God’s plan of the ages. Through her courage and ingenuity, she preserved the royal line of David through which the Messiah would come. Evil people like Athaliah will begin their work, but God can always raise up a Jehosheba. 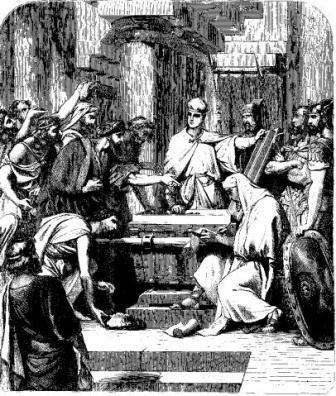 One reason the people resented this worship of Baal in Jerusalem so much was because according to 2 Chronicles 24:7, Athaliah had directed that sacred objects from the temple of the Lord be put into the temple of Baal: For the sons of Athaliah, that wicked woman, had broken into the house of God, and had also presented all the dedicated things of the house of the Lord to the Baals. There is no record of repentance on Joash’s part. He never came back to or fulfilled his bright early promise.....His servants arose and formed a conspiracy, and killed Joash: This is startling, and shows that the blessing of God long before vanished from the compromised king who began so well, but failed to finish well. I was not rebuking you. I thought you presented the email "as is" for our consumption. Having seen the story several times before (with various people said to be student), I thought I would do some checking up on the story. The way I look at it, if you had not posted it 2,700 people would not have had the opportunity to see the thought provoking discussion, and be warned about going out and claiming "Einstein" said this to others. If presented to a skeptic, they could attack the veracity of Einstein being the student, and ignore the point of the story. An easy diversionary tactic in a discussion. That is the only reason I brought it up.